“Cuckoo Radio, Caged Songs Sung (Tick Tock Tick)” is the title of an installation, pictured below, by Ven Voisey, running as part of the Arscape exhibition in Pittsfield, Massachusetts. The cages are speakers that emit different sounds throughout the day, mixing birdsong and electronic effects. 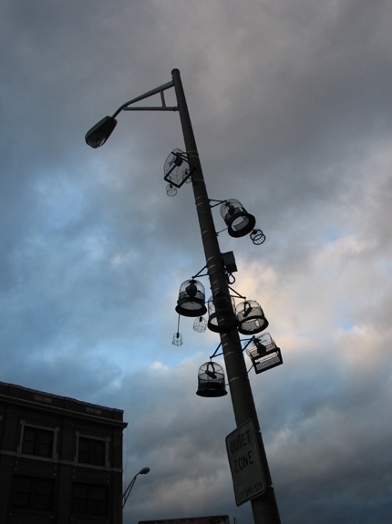 The precise location of the lamp post is 438 North Street in downtown Pittsfield, where “Cuckoo Radio” (part of the city’s Artscape exhibition) will stand through September of 2009. More details at Voisey’s website, v—v.net. When you sing with a group of people, you learn how to subsume yourself into a group consciousness because a capella singing is all about the immersion of the self into the community. That’s one of the great feelings — to stop being me for a little while and to become us. That way lies empathy, the great social virtue. Sound documentarian Will Montgomery ventured into the boiler room for his entry in the Touch Radio series (touchradio.org.uk). Montgomery recorded the hissing and clacking and otherwise deeply resonant doings of an underground heating system whose construction dates from the tail end of the Cold War (MP3). Like most entries in the Touch Radio podcast, Montgomery’s is at its core a field recording, but unlike the majority of Touch Radio efforts, his is not entirely devoid of his own touch — while the material is all raw field recordings, the noises have, as he puts it, “been organised into a composition” — one that has a narrative quality, a journey deeper and deeper into the paranoid. More info, including photos of the site, at touchradio.org.uk. Few acts have melded digital production with dub as seamlessly as Pole (aka German musician Stefan Betke). 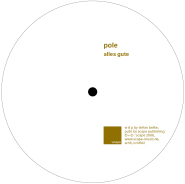 His lanky works have mixed snare shots and pixel-precise percussion, deep echo and techno flourishes, gurgling melodic snippets and minimalist simplicity for a decade now: 2008 marks the 10th anniversary of Pole’s debut, 1, aka “the blue one.” Last year saw the excellent Steingarten and its associated remix collection, and there will be a 12″ by the end of this year, titled “alles gute / alles klar,” half of which is available for free download from the releasing label, ~scape (MP3, scape-music.com). The song appeared previously on the ~scape compilation CD Round Black Ghosts, and it brings to mind the song-form explorations of Grassy Knoll and the classic ersatz Afrobeat of My Life in the Bush of Ghosts. It’s a tremendous track, with slurply bass lines lurking below the expertly programmed drum-machine beats. More at myspace.com/poleartist and pole-music.com; relatively recent interview at zero-inch.com. The newly upgraded Buddha Machine (version 2.0) is getting remixed, barely weeks into its commercial release. Over at Kill Ugly Radio (i.e., uglyradio.wordpress.com), the “piano” loop from the Buddha Machine 2.0 has been taken, backward-masked, and mixed as a conflation of three overlapping samples (MP3). The result is a kind of abstract chamber minimalism. It clocks in at three minutes, and though it’s built from a sample only 26 seconds long, the repeated material sounds fresh on each cycle, thanks to the shifting context of layered pianos and the lightly introduced digital effects. The Buddha Machine is a small device that resembles an AM radio. It doesn’t receive signals, though — it contains nine short loops that can be alternated through at the push of a button. Remixing is appropriate for a machine whose second iteration (which includes nine new loops, and the ability to slow or speed a given loop) was inspired by what musicians did with its first release. Christiaan Virant, one half of duo FM3 that created the Buddha Machine, said the following in an interview on Disquiet.com earlier this month: “It was really the fans that made us think about how to improve and upgrade the box. We always considered the Buddha Machine as our ‘album.’ But many, many people out there were inspired to use it as an instrument.” Read the full interview here: “Buddha Machine, Reloaded,” disquiet.com.